As I said, the drawing he put up isn't the same as in the 2007 paper that Anthony claimed, though it's derived from it. Anthony's chart is for a much wider area of the USA than California. The new paper is just about California. Anthony's chart only goes to 2003. It misses out on all the years of drought from 2003 to the present. The lead author of the 2004 and 2007 papers is Edward R Cook, who is also an author of the current paper that Anthony is scoffing at. Back to the tiny contribution to the article from Anthony Watts himself. (Yes, the words up top are his sole contribution.) He seems to think that the authors of this new paper think that "intense droughts only occur in the age of the SUV". Does he not even know that at least some of the authors have written extensively about the megadroughts themselves. That they've published lots of papers on the subject. That he, Anthony wouldn't have known the droughts had occurred except for the work of these very same authors? And what about him saying that they failed to take history into account in this paper. Did the article claim that there have never been droughts in California before? No. It didn't. Did it claim anything about the climatic history of the region? Yes it did. The recent history, not the history of 1,000 years ago. The reason being that the paper was analysing the current drought and comparing it to recent times. 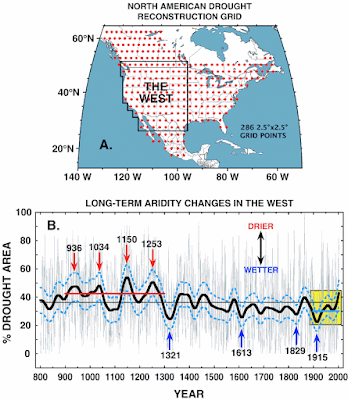 One thing the authors looked at was the extent to which anthropogenic warming contributed to the drought. Anthony must have wanted them to look at something else. Well, they have. Just not in this paper. And I doubt Anthony would be interested in reading their other work. If you want to know about the new paper, you can read the press release (or if you've a subs to GRL you can download the paper and read it). Figure 4. Contributions of anthropogenic warming and natural temperature variability to recent temperature and drought. 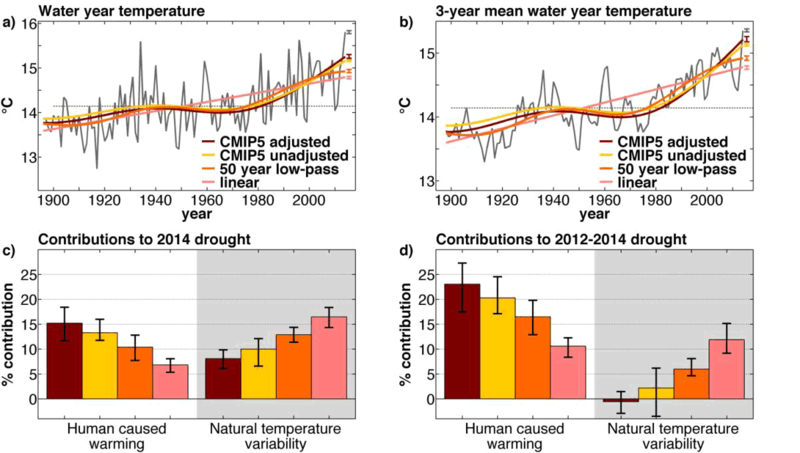 (a) Annual and (b) 3-year running water year temperature records with four alternate scenarios of anthropogenic warming. (c and d) Contributions of anthropogenic warming versus natural temperature variability to (c) 2014 and (d) 2012–2014 JJA PDSIsc anomalies, where bar colors correspond to the colors of the four anthropogenic warming trends in (a and b). For each of the anthropogenic warming scenarios, natural temperature variability is calculated as the observed temperature minus the warming trend. All time series and bars represent mean conditions across all combinations of climate products. Whiskers bound all values for (a and c) 2014 and (b and d) 2012–2014. A new study says that global warming has measurably worsened the ongoing California drought. While scientists largely agree that natural weather variations have caused a lack of rain, an emerging consensus says that rising temperatures may be making things worse by driving moisture from plants and soil into the air. The new study is the first to estimate how much worse: as much as a quarter. 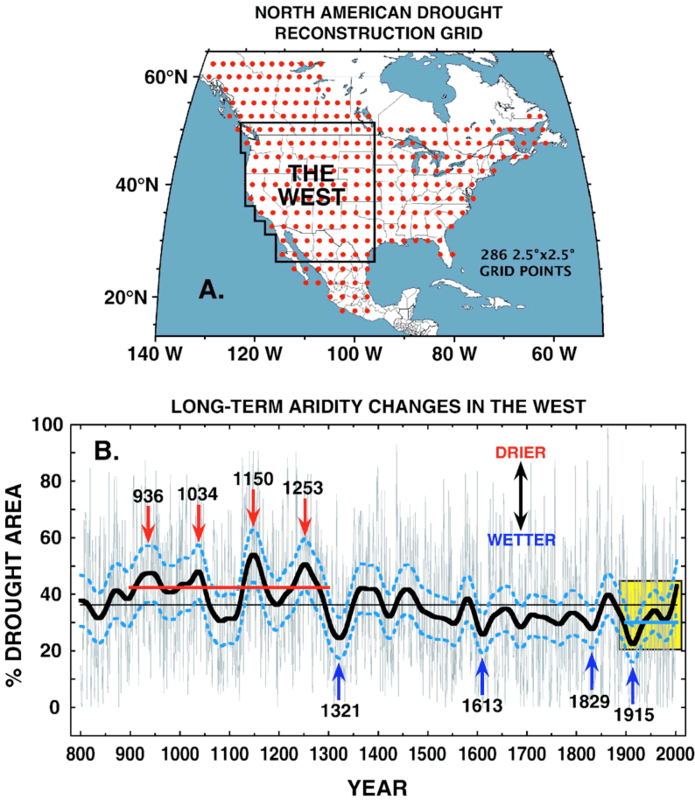 The findings suggest that within a few decades, continually increasing temperatures and resulting moisture losses will push California into even more persistent aridity. The study adds to growing evidence that climate change is already bringing extreme weather to some regions. California is the world's eighth-largest economy, ahead of most countries, but many scientists think that the nice weather it is famous for may now be in the process of going away. The record-breaking drought is now in its fourth year; it is drying up wells, affecting major produce growers and feeding wildfires now sweeping over vast areas. The researchers analyzed multiple sets of month-by-month data from 1901 to 2014. They looked at precipitation, temperature, humidity, wind and other factors. They could find no long-term rainfall trend. But average temperatures have been creeping up--about 2.5 degrees Fahrenheit over the 114-year period, in step with building fossil-fuel emissions. Natural weather variations have made California unusually hot over the last several years; added to this was the background trend. Thus, when rainfall declined in 2012, the air sucked already scant moisture from soil, trees and crops harder than ever. The study did not look directly at snow, but in the past, gradual melting of the high-mountain winter snowpack has helped water the lowlands in warm months. Now, melting has accelerated, or the snowpack has not formed at all, helping make warm months even dryer according to other researchers. Due to the complexity of the data, the scientists could put only a range, not a single number, on the proportion of the drought caused by global warming. The paper estimates 8 to 27 percent, but Williams said that somewhere in the middle--probably 15 to 20 percent--is most likely. Last year, the U.S. National Oceanic and Atmospheric Administration sponsored a study that blamed the rain deficit on a persistent ridge of high-pressure air over the northeast Pacific, which has been blocking moisture-laden ocean air from reaching land. Lamont-Doherty climatologist Richard Seager, who led that study (and coauthored the new one), said the blockage probably has nothing to do with global warming; normal weather patterns will eventually push away the obstacle, and rainfall will return. In fact, most projections say that warming will eventually increase California's rainfall a bit. But the new study says that evaporation will overpower any increase in rain, and then some. This means that by around the 2060s, more or less permanent drought will set in, interrupted only by the rainiest years. More intense rainfall is expected to come in short bursts, then disappear. Many researchers believe that rain will resume as early as this winter. "When this happens, the danger is that it will lull people into thinking that everything is now OK, back to normal," said Williams. "But as time goes on, precipitation will be less able to make up for the intensified warmth. People will have to adapt to a new normal." I don't think a single person at WUWT realised that Edward R Cook, famed drought expert, whose megadrought chart Anthony put up, was also a co-author of this new paper. Anthony didn't, that's for sure, even though he wrote his name in both places - here and here. kim thinks that scientists are fools. It's Kim who's looking foolish, wrongly thinking that the world hasn't warmed. It has. Wait, they got this drought while the world hasn’t warmed. I’ll bet it rains if it does. Bill Illis doesn't think it will rain in California this autumn, despite the El Nino that's developed. Time will tell. If it does, Bill will probably fulfil the prophecy in the last para I copied from the press release above. These studies are much like the Gore-effect. As soon as they are published, the opposite happens. Which means, of course, that they are just wrong and made the whole thing up. Much like every climate science prophesy study. “They showed that massive irrigation from underground aquifers has been offsetting global warming in some areas, because the water cools the air.” – All this time I thought the government scientists at NOAA claimed water vapor caused global warming via radiative forcing? I just hope it lasts long enough to force the development of new infrastructure. It generally doesn’t. The rain arrives just in time for politicians abandon planned long-term solutions once again. The first graph would seem to indicate that the earlier megadroughts were during the Medieval Warm Period, so is the claim so ridiculous? Charlatains have co-opted terminology from Statistics to apply the phrase ‘trend analysis” and related vocabulary to the concept that, for practical purposes, is defined as ‘we’re really just making this stuff up’. MikeH asks how scientists distinguish between drought and temperature when studying tree rings. According to this book, edited by ER Cook (one of the authors of this new paper, and the author of Anthony's drawing) - dendrochronology was used to study historical precipitation before it was used to study surface temperature. Didn’t Michael Mann show that temperature influences tree ring growth, not drought? Which is it? How does one differentiate between drought and temperature when reading tree rings? Is it more like reading tea leaves in the bottom of the tea cup? It’s up to interpretation of the one reading the rings? Is there a course I can take in Reading Tree Rings? So I too can predict the future. TomRude decides to join the game of "let's play stupid", too. He probably thinks that there's not been any drought in California. Or that water in California doesn't evaporate. Or that if it evaporates it falls back exactly where it came from. I went through all the WUWT comments in the archived version trying to detect signs of intelligent life. About the only one is how do they distinguish between drought and temperature in the tree ring record, because that's something I am ignorant about. But even than that had to be expressed in stupid language so as to please the flying monkeys. The one about distinguishing between drought and temperature could also have been formulated as an interested question, rather than assuming that scientists are stupid or evil. But then those people would not be at WUWT. It is not my field, but as far as I know it is about selecting the right regions. In regions where the growth of trees is limited by temperature (Arctic or mountains), they are good for temperature. In regions where the temperatures are normally fine, but water is limiting you can use tree rings for drought. In addition the spatial extend of the signal can help. To compute the temperature hockey sticks you use global data and an analysis method that focuses on changes that happen everywhere simultaneously (PCA) to see global temperature changes. Droughts are normally more regional and would be largely removed in such an analysis. Regarding drought or temperature, these are all parts of the generalized form of Liebig's Law of the Minimum. I don't think so, despite this infamous video. It seems logical that tree rings would be particularly good as a measure of past droughts. All indications are that trees grow far more rapidly during periods of abundant water supply. Trees don't grow all that well during floods. Trees also do not grow all that well when it is too hot for them, you can still use trees in cold locations as proxy for temperature. Just select the right region. Floods are generally short-term events which I wouldn't expect to have much impact on tree-growth.